Ok, I need to get a review up before everyone thinks I've left the reservation... not to say my mind hasn't left. In fact, if you see my mind hanging out at a bus stop, just go ahead and send him home, thanks! I've mentioned that I'm pretty backlogged with a bunch of random posts right now. I'm just not sure where to head at this moment. My crazy side says aim for the high fat stuff. My spare tire says I need to start eating "smarter". My lazy side says let's have a bowl of cereal and call it a night. Oh, and my brain says "why don't you try finding something different?" So, I went to the other side of the freezer aisle and started looking for a frozen dessert but I accidentally stumbled upon an ice cream treat. This is the NEW! WeightWatchers Smart Ones Peanut Butter Cup "signature" Sundae. 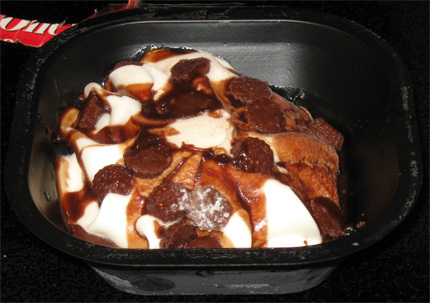 It's low-fat vanilla ice cream over a chocolate cookie crust, topped with fudge sauce and mini peanut butter cups. (2 per box) Looks tasty enough, but I'm skeptical of anything that claims to watch weight yet still contain peanut butter. Wow, that's it? I knew the box was light but man that is small, there is no way that's filling me. Ok, let's talk about specifics. Overall I find this treat, well, weird, very weird, yet somehow strangely satisfying. It's got this really strange lowfat ice cream that doesnt actually strike me as ice cream. 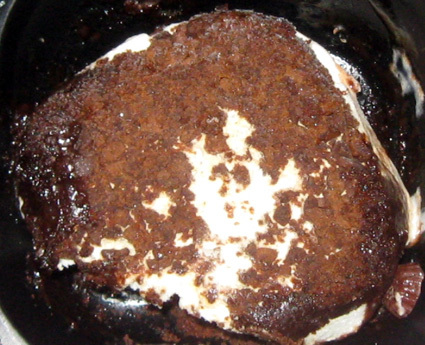 It's cold, and it's made of milk products, but that's where it ends. But wait, there's more. When they say cookie crust, they mean it. They've literally shaved some bizarre thin cookie in half and laid it at the bottom. (I need to cut the other one in half to really show it). So there's not a whole lot of cookie, but somehow it comes together with the gritty ice cream to give this treat an overall gritty/cookie texture that I found strangely amusing. It's not awesome, but at the same time, it's not your usual bland, boring super low fat ice cream. I don't have a ton to say about the peanut butter cups at the moment, in fact, they've kind of left my brain already. That'll have to wait for a second scoop I guess. Oh, and I was right, it didnt fill me. I was tempted to eat the second one, but to stay healthy-ish, I chased it down with some all natural kettle korn, which is also kind of sweet yet gritty so it kind of went together. On Second Scoop: Ok, I polished off the other lightweight treat last night. I took out a corner and realized I wasn't going to get a good shot, so I just flipped the whole thing over. The cookie "crust" is really just a very thin layer of cookie crumbs. I was thinking about the texture some more and basically it's reminiscent of one of those peanut cookies that has a hersheys kiss in the middle. Oh, the peanut butter cups are fine, we've seen them before on other treats. I've had these. Nothing spectacular but they'll do when looking for a lighter option with something other than just ice cream.